To purchase Black Mormon: The Story of Elijah Ables or For the Cause of Righteousness: A Global History of Blacks and Mormonism, 1830-2013, click here or here. As the first documented priesthood holder of African descent, Elijah Ables already enjoys a singular place in the history of black Mormonism. But in most discussions of Ables’s place in Mormon history, he serves as a foil for understanding the origins and development of the Mormon priesthood restriction on the black community; seldom does he enjoy the full subjectivity and personhood that a person of his accomplishment and stature would demand. Indeed, no phase of Elijah’s life highlights the troubled relationship between the early LDS and black communities in the way that Elijah Ables’s time in the slums of East Cincinnati does. Likely a runaway slave from western Maryland (a probability borne out by the fact that 4/5 of the black residents in the area were slaves), Ables had been slowly winning Joseph Smith’s favor since coming joining the LDS community in Kirtland between 1832 and 1835. Joseph had a general distaste for black people, to be sure; in April 1836, he wrote that blacks made up a “a community of people who might. . .overrun our country and violate the most sacred principles of human society; chastity and virtue.” And Missouri had left the Saints rattled about any perceived relationship with the black community. Governor Daniel Dunklin warned W.W. Phelps that if the Saints did not actively distance themselves from the abolitionists, then the epithet of “abolitionist” would certainly stick. In the court of white opinion, the Saints were considered to be guilty until proven innocent. 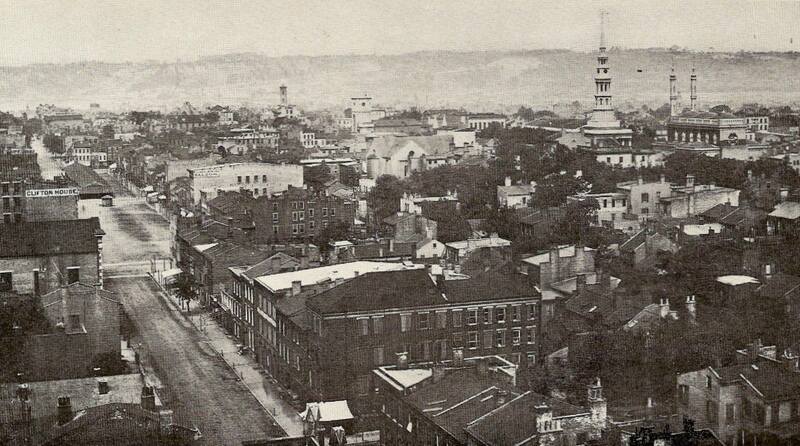 Elijah left Nauvoo for Cincinnati in early 1842, at a time when the Cincinnati branch was on the verge of falling apart at the seams. Ables had to shake off difficulties of his own; in 1839, he had been accused of causing myriad problems on the mission, ranging from wrestling with the white Elders a little too much to harboring too much paranoia about the looming civil war about to explode in Ontario—a fear that proved to be justified. But Ables left it behind him and relocated to Nauvoo where he could be beside his one true ally in the faith: Joseph Smith. Ables knew how to go it alone; some years earlier, Joseph Smith had commissioned him to serve a lone mission to Ontario, Canada in what might well have been the first attempt to establish a black mission area in Mormonism. As a freshly-ordained member of the Seventy, Ables brought to Cincinnati an authority and gravitas than even some white members did not enjoy. And he wielded it with little reservation. He preached to the local whites freely, not fully recognizing the depth to which the tensions from the year-old riots still loomed in the Cincinnati air. Within a few months of Ables’s arrival in Cincinnati, a local eccentric philanthropist, Rees E. Price, joined the fold. Price was the radical’s radical—the kind who would in later years gently suggest that abolitionist William Lloyd Garrison had not gone quite far enough not only in opposing slavery but in supporting theocracy. As the owner of a large estate in northwest Cincinnati (now known as Price Hill), Price enjoyed enough respectability for people to give his penchant for odd theology. Moreover, he had served for years on the Executive Board of the Ohio Anti-Slavery Society and hobnobbed with leading Ohio abolitionists such as Charles G. Finney, John Rankin, and James G. Birney. Price almost certainly participated in the Underground Railroad. That Ables and Price knew each other is almost certain, though the depth of their relationship remains unknown (Stevenson, Black Mormon: The Story of Elijah Ables, chpt. 4). By the following summer, Ables’ efforts to reach out to the Cincinnati community had exacted a toll. Cincinnati whites did not appreciate a black Mormon man daring to preach to them on a level of equality. In June 1843, Heber C. Kimball, Orson Pratt, and John Page passed through Cincinnati during a fund-raising trip Eastward to help with the construction of the Nauvoo Temple. Not only did they need to deal with problems among the ranks of leadership (Heber C. Kimball compared the branch to “a parcel of old Hens quarreling for one nest with one egg in it”), they also had to deal with the Elijah Ables problem. The neighborhood near Elijah’s Cincinnati meeting site at the fire station. Courtesy Cincinnati History Museum. The visiting leadership did not know quite what to do with him. Joseph Smith’s support for the black elder was unabashed, but local circumstances had made Elijah a liability. Page acknowledged that “he respects a colored Bro as such but wisdom forbids that we should introduce [him] before the public.” Ables accommodated the white leaders, responding that he “had no disposition to force himself upon an equality with white people.” The leadership held that Ables should restrict all preaching activities to fellow blacks (Cincinnati Meeting Minutes, June 25, 1843, copy in author’s possession). The decision did not appear to have a lasting impact on Ables’s standing in the branch, though it might have pushed Rees E. Price away from activity. By January 1844, Price had left the fold and continued his missives about Queen Victoria, the Second Coming, and slavery from his estate. By 1850 Price had radicalized further, identifying his profession as “Theocrat.” Following the death of Joseph Smith in June 1844, Ables continued activity in the Cincinnati branch; a year later, he oversaw the excommunication of three female supporters of Sidney Rigdon’s faction. His branch president, John Crippin (later a supporter of William Smith’s claims to being Joseph Smith’s successor), applauded the black Seventy’s action: “There is more union existing in this branch than there has been for the last three years.” In spite of the discriminatory action executed against Ables the previous summer, he kept a white-knuckle grip on his membership, even taking measures to ensure the unity of the branch in spite of his personal grievances (“Minutes of a Special Conference of the Cincinnati Branch of the Church of Jesus Christ of Latter-day Saints, held at Elder Pugh’s on the 1st day of June, 1845,” Times and Seasons 6, no. 10 (June 1, 1845): 915). W.E.B. DuBois spoke of the “double consciousness” that black Americans found themselves constantly juggling in navigating white society. Ables’s task was even more foreboding. As a black Mormon wielding ecclesiastical authority in a white faith community inching ever closer to full racial discrimination, Ables found himself at the vortex of whirlwind of racial politics that threatened to—and eventually would—envelop the Saints over the coming decade. Ables’s holding the priesthood is perhaps one of the least interesting aspects of his life Yet this is the story that attracts the most attention; given later events, this is understandable. Many modern readers perpetuate some of the same problems that created the priesthood restriction in the first instance: one-dimensionality and tokenism. Ables was not merely the token black hero of Latter-day Saint history. He displayed the political skill of a man navigating many identities within a community ill-disposed to making a place for him. A servant though he was, Ables also served as diplomat, hardliner, fix-it man, and leader. In 2015, our treatment of Elijah’s life deserves more—much more. I spent a few years in Cincinnati. There’s a reason it’s one of the few large metropolitan areas in the U.S. that’s still more than an hour from any temple–there aren’t all that many members of the church there, and especially not many in the actual city itself. And the race issues still cause problems. Almost all neighborhoods remain entirely segregated. There’s a surprising amount of racism. Most churches and schools are also pretty segregated. About seven years ago, a “downtown” (aka African American) branch merged into a larger ward and then immediately split into two smaller wards, and shortly thereafter many of the African Americans who had been in that small branch became less active. A handful continued to come. The church is still struggling with race issues in Cincinnati, and will probably continue to struggle as long as Cincinnati itself does. Quite a story, Russell. From our modern vantage point, colored as it is by all the events that have happened since — the Civil War, emancipation, the LDS priesthood ban, the Civil Rights era, and the reversal of the priesthood ban — it is hard to appreciate the complex racial culture that Ables had to navigate, both within and without the Church. Joseph’s unequivocal support for Ables is pleasantly surprising, especially given the pushback he got from some of the other LDS leaders of the time. I should say, I have a tremendous appreciation for the time and research that’s been poured into this important part of our history. Thank you for this. Thanks for your ongoing work on Brother Ables, Russell. Could you clarify a couple of things for me? In the phrase “the city had faced at major race riots in the past seven years” it seems like something got garbled in the transmission. And your parenthetical aside about “the 4/5 slave/free black ratio in the region” raises several questions. Is the region in question Cincinnati or Western Maryland? It’s unclear given that the most recently mentioned region is the latter, but the point seems more apropos to the former. Finally, your ratio seems to imply that there were four [former] slaves for every five free black persons (44%). Did you mean to say that four out of five black persons in Cincinnati were former slaves (80%)? I don’t mean to sound pedantic. I’m very interested in this subject, and I don’t want to misunderstand. Thanks again for your research. To me, Maryland in fact seems more apropos to the context, as it was a slave state, and Ohio, a free one. Otherwise, the statistic would not make sense. The 4/5 ratio demonstrates the likelihood that Elijah had at one point been a slave, but he could have also been part of the free 20%. Wow, amazing story, and book. I’d love to read it.